On January 15, 2017, Jain International Trade Organization (JITO) hosted JAINA Delegation for a lunch meeting at JITO’s headquarters in Ahmedabad. JITO is the largest Jain organization in India. JITO thanked JAINA team for hosting Youths from India for last 2 years. JITO graciously offered to host youths from USA/ Canada for our joint Youth Exchange program, including visits with industry giants in India. Please contact Kamleshji Mehta if you are interested in participating in JAINA Youth Exchange program at kmehta@aspirecom.com. On January 17, 2017, JAINA Delegation consisting of JAINA President Ashok Domadia, First VP Gunvant Shah, Past JAINA President Dilip Shah, JAINA Director Haresh Shah and JAINA IT Manager Dhimen Vora visited Shrimad Rajchandra Ashram in Agas, which is forty miles from Ahmedabad. JAINA Delegation had the opportunity to take part in the Shrimad Bhakti in the morning, Darshana in the Temple and lunch on the vast and serene campus of the ashram. The Delegation was given warm welcome and tour of the facility including the book store and insightful conversations with some of the residents / devotees. It was a spiritually uplifting experience. Next day on January 18, 2017, JAINA Delegation had the good fortune to attend Acharyapad Ceremony of Shri Dharmarikshit Suri and Shri Hemvallabh Suri. Over 10,000 attendees participated in this event and it was a life-time opportunity to witness a unique Acharyapad Ceremony. Later the same evening, JAINA Dlegation visited Tapovan. Shri Lalitbhai Dhami gave JAINA Delegation tour of the facility where 350 resident students attend Tapovan school. After dinner the delegation attended Bhakti Bhavana with the students. JAINA delegation visited Bidada Sarvodaya Hospital on January 24, 2017. The Hospital was conducting a 5 day wellness camp for high school children. 3,500 boys and girls were given free complete medical checkups including vision, hearing and dental checkups. 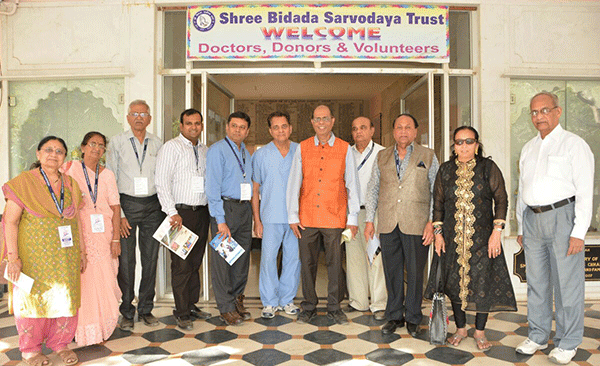 Dr Girish Shah from New York led a team of 35 volunteer Dentists (USA and local). Dentists provided not just diagnostic but carried out on the spot full dental procedures including filling cavities and crowns. JAINA Delegation also got the opportunity to see Jaya Rehab center and newly built Nature Cure facility on the Bidada campus. JAINA Delegation attended Global Veerayatan Conference at Veerayatan Vidyapeeth in Jhakhania, Kutch from January 24-26, 2017. JAINA Delegation consisted of Ashok Domadia – JAINA President, Gunvant Shah – JAINA First VP, Dilip Shah – JAINA Past President, Sushil Jain – JAINA Past President, Haresh Shah – JAINA Director, Jainesh Mehta – Houston, Dhimen Vora – JAINA IT Manager and many other JAINA members from USA and Canada. Veerayatan Institute of Technology and Polytechnic was formally inaugurated. Over 300 Jain Leaders from around the world attended Veerayatan Global Conference. JAINA President Ashok Domadia eloquently addressed more than 6,000 attendees on JAINA's recent achievements and global outlook on January 26, 2017. This august gathering of global Jains appreciated the way JAINA President presented the Global outlook of JAINA, including recent on-line Pathshala roll out by YJA and upcoming 24x7 JAINA TV rollout. There is an immense interest in both the projects as Jains in and outside India can greatly benefit from it. JAINA President noted that JAINA had sponsored the very first school of Veerayatan outside Rajgiri at Lachwad, which is Bhagwan Mahavir’s birthplace. Shri Ashok Domadia announced that Veerayatan President, Shri Abhay Firodia, will be a Key Note Speaker at upcoming JAINA Convention-2017. Acharyashri Chandanaji's 81st Birthday was celebrated in presence of Pujya Morari Bapu on January 26, 2017.He addressed Acharyashri as “MAA” and showed his reverence towards her. The moment was historic as two religious Leaders of different faiths- Jain and Hindu - were sharing the same platform and attendees were blessed with their divine presence. On January 24, Gunvant Shah addressed the gathering during Welcome program and invited all to attend JAINA Convention 2017 from June 30- July 4 in New Jersey. On January 25, 2017, the Celebrations of Acharyashri Chandanaji's 81st birthday was marked with lighting of 81 lamps by all dignitaries This was followed by cultural programs by students of Veerayatan Vidyapeeth in Kutch. Veerayatan Kutch had meticulously planned the entire event and meticulous care was taken from hospitality, logistics, food etc. for comfort of all the attendees. A school for local children of palaquin bearers (Doliwalas) was inaugurated at Palitana by Pujya Morari Bapu. It is a unique School in the sense that it is dedicated to dire need of school for Doliwalas who help Jain pilgrims with Palitana yatra. Veerayatan is developing a unique school for religious education and training of Sadhvijis – first ever such school dedicated to our Sadhvijis. Sadhvijis will also be taught different languages so that they can read the scriptures well. Bhoomi Pujan and Shilaniyas was conducted in presence of Acharyashri Chandanaji and Pujya Morari Bapu.